Following up on last week’s post about how social media affects your experience of the world around you, I decided to look into a new trend I only recently heard about: “tweet seats.” This is where a section of a concert hall, movie theatre, or performance space is set aside specifically for people who want to post Twitter comments via their mobile devices. I came across a great article about this on the NPR blog: ‘Tweet Seats’ Come To Theaters, But Can Patrons Plug In Without Tuning Out? The Cincinnati Symphony Orchestra offered a small section of tweet seats and got a generally favorable response from concertgoers. During the concert, they had someone backstage tweeting their insights into the music you’re experiencing. Patrons could follow a specific concert via a hashtag (#), post their comments, and read what other people thought about the performance. This is not a totally new concept. Back in 2004, I attended a Pittsburgh Symphony Orchestra concert where they were testing the Concert Companion, a handheld device similar to a Palm Pilot which provided real-time program notes during the performance, and I tried it out. On the program was Debussy’s Prelude to the Afternoon of a Faun, one of my very favorite pieces of classical music. As the device identified the various elements of the piece, which instrument was playing the solo at that moment, etc., I found that I did listen to the music in a new way and didn’t find it too distracting from the actual concert experience. For another look at the Concert Companion, read this 2004 New York Times article about a New York Philharmonic concert: A Concert You Could Read Like a Book. This writer’s experience was similar to mine, except that his device locked up right near the end of Stravinsky’s Petrouchka, so he missed reading the notes about the ghostly cackle (one of the best parts of that piece). I think technical glitches were an ongoing problem with those devices, which may explain why they never became widely used and have gone the way of the Palm Pilot. And the Concert Companion was only for that specific purpose, and didn’t offer two-way communication. 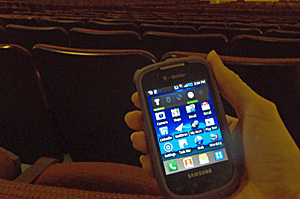 With today’s smartphones and the newer technology, I could see where orchestras could find a way to use a handheld device to engage the audience and improve the concert experience. This article – Could Tweet Seats In Theaters Be The New Smoking Section – goes a little deeper into the pros and cons of tweet seats. Among the advantages: engaging younger patrons and getting some free publicity for a show or movie. Disadvantages: breaking the essential link between the performer and the audience, encouraging people’s notoriously short attention spans in today’s digital universe. That comment had the most recommendations of all the comments posted on that story, and I’m inclined to agree. What’s your take on it? This entry was posted in Synchronicity: Musings on Words, Music, and the Arts and tagged concerts, marketing, performance, social media, theatre, tweet seats, Twitter. Bookmark the permalink.